NYC is bursting at the seams with great art. But if you're traveling to NYC with a toddler, you may think you need to skip the great art galleries this city has to offer for more toddler-friendly activities. That doesn't necessarily need to be the case. True, some of the art galleries are not exactly toddler-friendly (or paying $25 per person only to be endlessly chasing your toddler away from the priceless Pollock may not feel like your idea of a good time). However, there are still plenty of ways to check out great art when visiting NYC with a toddler. Some galleries are surprisingly great choices for babies and toddlers. The Littlest Passport wrote about Brooklyn Museum earlier this year, and Babyccino Kids highly recommends The Met. Bonus: Both galleries are close to great playgrounds and green spaces to let your little ones run around after a gallery visit - or, conversely, wear them out and stroller nap them while you explore the galleries further. (Prospect Park is a 5 minute stroller walk from Brooklyn Museum with many great playground options - Zucker Natural Exploration Area is a favorite while the Garfield Tot Lot offers plenty of afternoon shade and safe play for crawlers and new walkers - and The Ancient Playground is situated right outside The Metropolitan Museum of Art). Beyond galleries, there are great toddler-friendly installations, murals and events to view all over New York City, sometimes in the most unsuspecting of places. But as a visitor, how can you find them? The Littlest Passport highly recommends the Instagram account @FOMOfeedkids if you are an art lover planning a vacation to NYC with a toddler or preschooler. The feed describes itself as NYC's cultural curator for kids. It is the pint-sized offspring of @fomofeed, which similarly serves to alert folks to fun pop art experiences within New York City (also worth a follow). NYC vacationing with a toddler? DIFFICULT CONDITIONS at the Children's Museum of the Arts is worth a visit. Launched in May 2018, @FOMOfeedkids features everything from the latest events, galleries, pop-ups, and activities that shouldn't be missed - for New Yorkers and family travelers alike. Manhattan-based Mom blogger, writer and Instagrammer behind @LittleKidNYC collaborated with @fomofeed to create this new spin-off. Her photos (on both @LittleKidNYC and @FOMOfeedkids) will inspire you to introduce your child to the rich cultural tapestry of NYC. She's also inspired plenty of other parents - check out #fomofeedkids to view families' NYC art photos and get even more ideas of where to go to experience art on your NYC toddler adventure. So far, @FOMOfeedkids has generated an NYC summer to-do list for our almost-two-year-old that includes a visit to the Children's Museum of the Arts; a trek to Brooklyn's Industry City to take in some stunning installations sure to awe parents and toddlers alike, including Escher The Exhibition & Experience ; and Soho's Galeria Melissa, a high-fashion shoe store meets an every-changing art installation space. The feed also put reminded this Mom and Dad to put an outing to Governor's Island back at the top of our summer list. A short ferry ride from either Manhattan or Brooklyn, the car-free island includes hammocks, a small playground, bike rentals, stellar Manhattan views, yummy eats and the fascinating art installation The Eclipse, in which the artist transformed the Governor’s Island Chapel of St. Cornelius with over 15,000 black and white bamboo and paper kites that dangle from the ceiling. 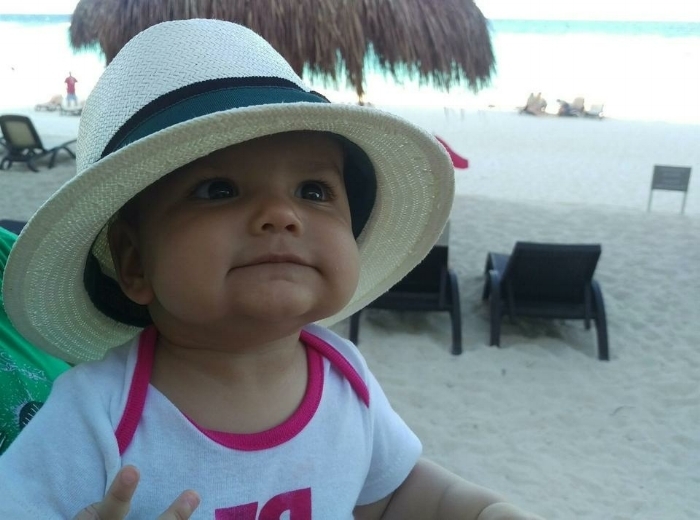 The outing offers plenty for parents and toddlers alike. 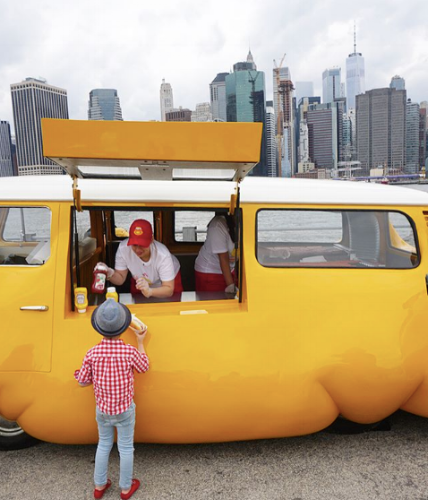 Finally, if you read The Littlest Passport's article on visiting DUMBO and Brooklyn Bridge Park with a toddler, and decided to include them on your NYC vacation must-see list, stop by Erwin Wurm’s new interactive installation Hot Dog Bus every weekend from 12-6pm. Meat-eating toddlers will love it, since the converted VW van will be serving free hot dogs with condiments (no word of whether there are vegetarian options). Parents can contemplate "the relationship between capitalism and consumption in today’s culture." 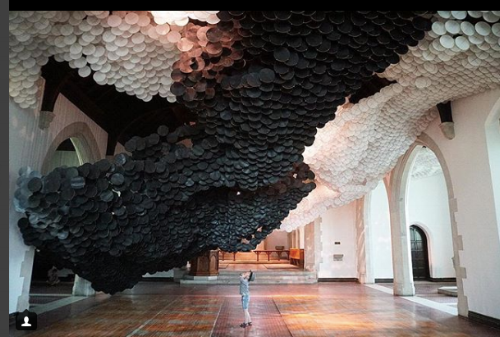 Full details on the Public Art Fund website. Hot Dog Bus by contemporary artist Edwin Wurm every weekend this summer in Brooklyn Bridge Park. Art meets free hot dogs - a toddler must-see!